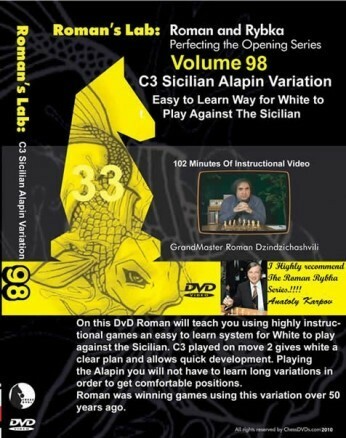 VOLUME 98 - c3 Sicilian Alapin Variation On this DVD, Grandmaster Roman Dzinzichashvili will teach you a powerful, easy-to-learn system for White to play against the Sicilian Defense. With the move 2. c3, known as the Alapin Variation, White has a very clear plan and positions himself for rapid piece development. With the Alapin Variation , you will not have to learn long variations in order to get comfortable positions. Roman has been using the Alapin Variation of the Sicilian Defense for over 50 years and is considered one of the world's foremost authorities on this under-appreciated system. The GM clearly laid out the reasons for the Alapin and was very honest that it isn't the best line to play for a win but that it avoids a number of complex prepared lines that the typical Sicilian player may be used to playing. Given the backdrop his analysis is reasonably complete for the white player and he shows the way through the complexities of the opening. He does give several analyzed games to help. I have compared this with other Alapin dvd's and books and it addresses the line as completely or more completely than others. He also shows how a move order can be critical in handling the opening.